Raspberries, whipped cream, sugar, gelatine and little else. Then you have a great cake that can be used both for dessert and the coffee table. It can also be made with strawberries if you like that better. It is also an incredibly beautiful cake. 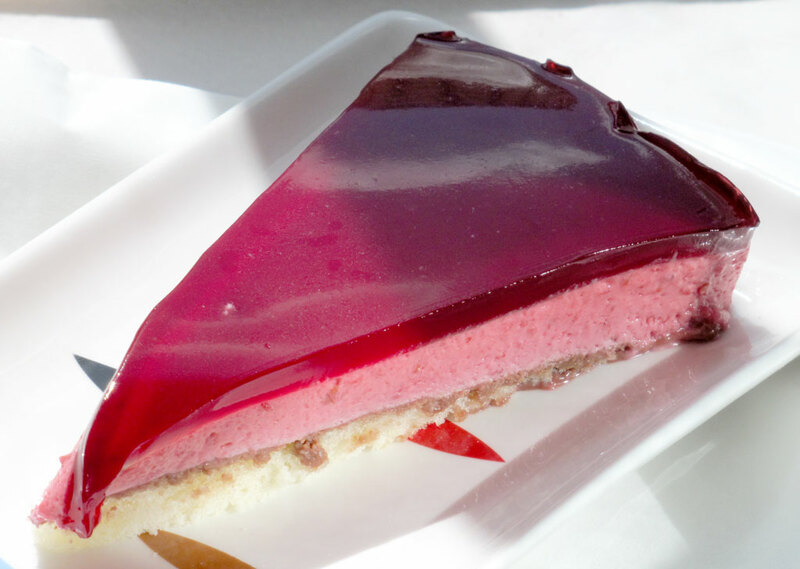 In principle this cake is just a base of sponge cake with a lot of raspberry mousse, and some red raspberry jelly on top. But it looks and tastes a lot more complex than that. I can not stop eating it when first I get started. a splash of your favorite alcohol, preferably with orange. Come pie base of a springform. Make it possible splash of alcohol. Put the gelatin into a bowl of cold water. Puree the raspberries with the sugar. I use a hand blender. Melt the gelatin in the lemon juice. Using a warm water bath. Stir the melted gelatine into raspberry puree. Add one-third of the whipped cream and mix it well. When it is well mixed put in the rest of the whipped cream. Pour the mousse into a spring form and spread it well. The top should be completely flat. If there are any peaks left they will end up like cherry icebergs in a red sea of jelly, and your dessert will be a complete Titanic. Use a spatula or any other suitable tool. Remember that the mousse is not to reach up to the top of the spring form. There must be some room for the jelly at the top. Put it into the fridge for a few hours. Preferably covered with plastic wrap or a plate, so it does not take on the taste of the refrigerator. Let the frozen raspberries, the 3 dl (1 cup) water and lemon juice simmer for 15 minutes. Pour the simmered berries into a strainer and strain of the juice. Crush them well so that there you get 3 dl juice. Add a few tbsp of water if needed. Add sugar to taste as you melt it in the hot juice. Let it cool a little and melt the gelatin in the hot juice too. When gelatin is lukewarm (same temperature as your little finger when dipped) then pour it into the spring form. Let it all cool for a few more hours. When it is to be served, carefully slice along the edge of the spring form so that the side gets unstuck, and then remove the "spring side". Arrange onto a nice plate. Enjoy.